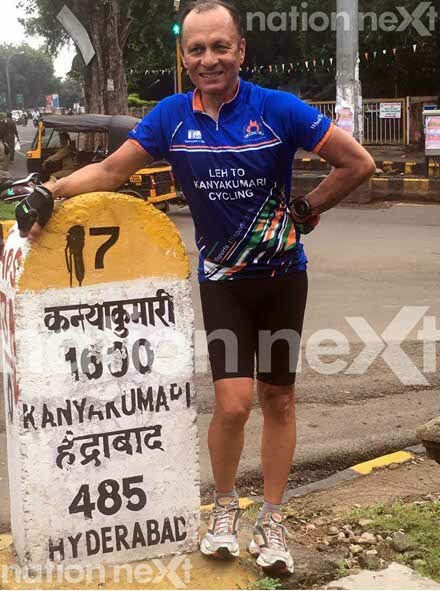 59-year-old Gagan Khosla cycles from Leh to Kanyakumari in 29 days! A few days back, Nation Next told you about Gagan Khosla, a 59-year-old chartered accountant and entrepreneur, travelling from Leh to Kanyakumari (more than 4000 kms) on cycle to inspire Indian youth. Gagan, an active member of the Scindia School of Old Boys Association (SOBA), started his journey on September 21, 2016 from Leh. On October 20, Gagan reached Kanyakumari crossing 13 states in 29 days on his cycle. Interestingly, Gagan did this expedition as a gift to himself on his 60th birthday! What a way to celebrate your b’day, all we can say! We at Nation Next congratulate Gagan Khosla for achieving this milestone and salute him for proving that ‘age is just a number!’ More power to you Gagan Khosla!